Heat oven to 350°F. Spray bottom only of 9-inch square pan with cooking spray. In small bowl, mix streusel ingredients with fork until crumbly; set aside. In large bowl, mix flours, 3/4 cup brown sugar, the baking powder, baking soda and salt. 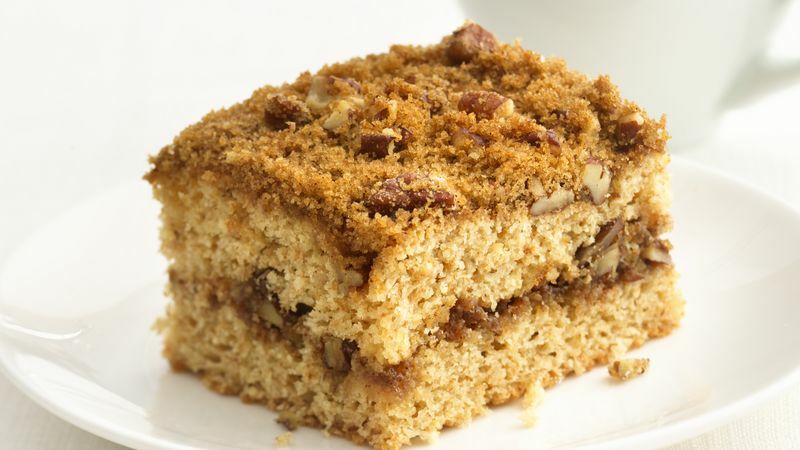 Stir in remaining coffee cake ingredients until well blended. Spoon half of batter in pan, spreading evenly. Sprinkle 1/2 cup of the streusel evenly over batter. Drop remaining batter by spoonfuls over streusel; carefully spread. Sprinkle with remaining streusel. Bake 30 to 35 minutes or until toothpick inserted in center comes out clean. Cool about 1 hour. Serve warm. *To toast pecans, heat oven to 350°F. Spread pecans in ungreased shallow pan. Bake uncovered 6 to 10 minutes, stirring occasionally, until light brown. We used fat-free sour cream in this recipe, but you can use reduced-fat sour cream instead. Toasting the pecans is a great way to add extra flavor without increasing fat or calories.